Hold the power of military action in the palm of your hand. 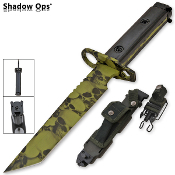 The premium of tactical knife quality, Shadow Ops presents a choice bayonet like no other. Unsheathe the 7.5-inch tanto blade covered with green zombie skulls and a super sharp edge able to saw gnats in two. The forged tool steel is flawless and runs throughout this full tang weapon. Able to attach to any AR-15, Shadow Ops bayonets are versatile and effective. The free included sheath is made from extra strong ABS plastic, bolted and sure to never fail. Adjust the carrying strap to take your knife on your next journey attached to your gear or leg.